Red Deer, Alta. 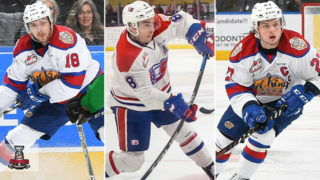 – The Western Hockey League held its annual WHL Awards ceremony today at the Sheraton Red Deer Hotel in Red Deer, Alta., to honour the top performances from the WHL’s 2017-18 season. For photos from today’s event, please click here. Please credit all photos to Rob Wallator/Western Hockey League. In a shortened regular season due to illness and a gold-medal performance for Canada at the 2018 IIHF World Junior Championship, Hart still managed to prove his worth as one of the top goaltenders in the entire CHL. A defending two-time winner of the Del Wilson Memorial Trophy and nominated once again in 2018, the product of Sherwood Park, Alta., stood on his head with a record of 31-6-1-3 alongside a WHL-leading 1.60 goals-against average, .947 save percentage and seven shutouts. Selected by the Philadelphia Flyers in the second round (48th overall) of the 2016 NHL Draft, Hart was named WHL Goaltender of the Week on seven separate occasions and backstopped his Silvertips to the top record in the Western Conference, as well as the second U.S. Division banner over his four-year tenure. After being selected in the first round (19th overall) by the Hurricanes at the 2016 WHL Bantam Draft, Cozens first turned heads during the 2017 WHL Playoffs as he appeared in 12 contests, amassing eight points (3G-5A). In his first season of full-time eligibility, the product of Whitehorse, Yukon, picked up where he left off, collecting 53 points (22G-31A) in 57 games during the 2017-18 regular season. His 53 points were good enough to finish second in the WHL’s regular season rookie scoring race. Cozens is eligible for the 2019 NHL Draft. Hart is a two-time defending winner of the Del Wilson Memorial Trophy, and was previously recognized as the CHL Goaltender of the Year in 2016. The product of Sherwood Park, Alta., put together another outstanding campaign, leading the WHL in a number of major statistical categories, including goals-against average (1.60), save percentage (.947) and shutouts (7). The 19-year-old goaltender finished with a record of 31-6-1-3 in 41 appearances during the 2017-18 WHL regular season. 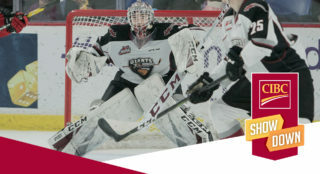 Selected by the Philadelphia Flyers in the second round (48th overall) of the 2016 NHL Draft, Hart was named WHL Goaltender of the Week on seven separate occasions, including four consecutive weeks from November 13 through December 10. Hart also helped backstop Canada to a gold medal at the 2018 IIHF World Junior Championship in Buffalo, N.Y. In his fourth full WHL season, Clague split time between the Moose Jaw Warriors and Brandon Wheat Kings. In 54 regular season appearances, the product of Lloydminster, Alta., posted a career-high 71 points (11G-60A), good enough to finish in a tie for third in scoring among all WHL defencemen. Selected by the Los Angeles Kings in the second round (51st overall) of the 2016 NHL Draft, Clague helped Canada to a gold medal at the 2018 IIHF World Junior Championship in Buffalo, N.Y. Clague was originally selected by the Wheat Kings in the first round (sixth overall) of the 2013 WHL Bantam Draft. In 195 career WHL games, Clague has 167 points (26G-141A) to his name. For the second consecutive season, a Broncos player is nominated for WHL Most Sportsmanlike Player of the Year after Tyler Steenbergen took home the honour in 2017. For Heponiemi, he was named WHL Rookie of the Year in 2017 and followed up with an outstanding 2017-18 WHL regular season. The product of Tampere, Finland, registered 118 points (28G-90A) and was only penalized for 28 minutes in 57 games. Heponiemi’s performance was good enough to earn him WHL Player of the Week honours for the week of November 6-12. Selected in the second round (40th overall) by the Florida Panthers at the 2017 NHL Draft, Heponiemi has collected 204 points (56G-148A) in 129 games with the Broncos. He originally came to Swift Current via the 2016 CHL Import Draft, chosen in the first round (10th overall). A product of Lloydminster, Alta., Smith was selected by the Chiefs in the first round (first overall) of the 2015 WHL Bantam Draft. In his second season behind the bench for Swift Current, Viveiros guided the Broncos to an impressive record of 48-17-5-2, good enough to finish second in the WHL’s overall regular season standings. The 103 points serve as the second best total in Broncos’ franchise history, with only the 1988-89 Broncos registering more (111 points). Under the direction of Viveiros, the Broncos represented one of the top teams in the entire CHL this season, finishing fourth in the CHL Top 10 and maintain rank for the majority of the 2017-18 season. In his sixth season as General Manager of the Silvertips, Davidson served as the architect for a Club that claimed its fifth U.S. Division banner in franchise history. In addition to the drafting and development of goaltender Carter Hart over the years, Davidson oversaw the acquisition of Washington Capitals prospect Garrett Pilon and Dallas Stars prospect Ondrej Vala – two key additions that bolstered an already strong roster ahead of the WHL Trade Deadline. Davidson also roped in key depth throughout the season, bringing in the likes of Ethan O’Rourke, Luke Ormsby, Spencer Gerth, Bronson Sharp and Jameson Murray. 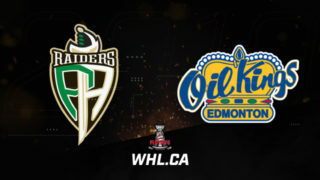 Having delivered another exciting season of new marketing initiatives and achievements in 2017-18, the Edmonton Oil Kings are the Eastern Conference Finalist for the WHL Marketing/Business Award. Within the friendly and fresh confines of Rogers Place, the Oil Kings deliver a cutting-edge game presentation, elevating the experience for passionate and dedicated fans. Undoubtedly, this contributes to the Oil Kings’ standing as the WHL leader in nightly attendance for the second consecutive season. Through a variety of community and charitable initiatives, the Oil Kings contributed more than $225,000 to the community of Edmonton and surrounding area, including the creation of two new scholarships for schools in Edmonton and surrounding area. RE/MAX Presents: WHL Suits Up with Don Cherry served as an outstanding highlight within the Oil Kings promotional schedule in 2017-18. 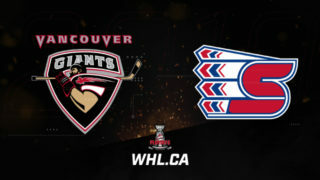 Garnering attention from Don Cherry and Hockey Night in Canada’s Coach’s Corner, the Oil Kings also found themselves in the Sportsnet spotlight with Gene Principe. The Oil Kings organization prides itself on the success of its annual Teddy Bear Toss game, which once again exceeded previous marks, collecting a Club record 14,122 plush toys an raising another $20,000 in December 2017. The Saskatoon Blades education program excelled once again during the 2017-18 season. A highlight within the group is Chase Wouters, who was recognized as the WHL’s Eastern Conference Scholastic Player of the Year for his outstanding achievements in the classroom. The Blades’ commitment to academic excellence is supported by Education Advisor Kim Hebert, who has worked diligently for 13 seasons with all players and prospects to ensure each individual has the best opportunity to experience academic success as they are capable. While playing in Saskatoon, players attend weekly study halls and ongoing career counselling seminars, engage in regular communication with Hebert, and are provided with a concise understanding of the WHL Scholarship program along with all the options it offers. Whether still in high school or having graduated, every member of the Saskatoon Blades is involved in an academic endeavour. All players graduate in a manner that has them ready for post-secondary education and those already out of high school pursue post-secondary courses on campus at the University of Saskatchewan or through correspondence at Athabasca University. For the second consecutive season, Brett Iverson is the WHL’s Top Official. Adding to an already impressive resume, Iverson skated at the 2018 Winter Olympics in South Korea and was recently assigned to the officiating team for the 2018 IIHF Men’s World Championship for the third consecutive season. The product of Richmond, B.C. 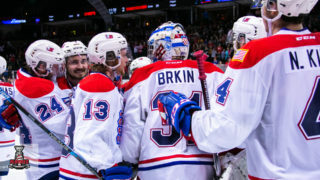 has enjoyed a remarkable set of assignments, including the gold medal game at the 2016 World Junior Championship, multiple CHL Top Prospects and CIBC Canada-Russia Series games as well as multiple Mastercard Memorial Cup games, including the final in 2015. 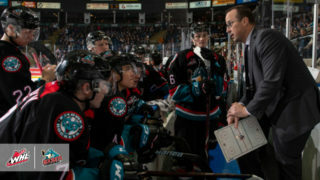 In addition to his work in the WHL and on the international stage, Iverson is an active official in the American Hockey League. For the first time in franchise history, the Moose Jaw Warriors claimed the Scotty Munro Memorial Trophy as WHL Regular Season Champions for the 2017-18 season. The record of 52-15-2-3 (109 points) represents the best in franchise history and the first time the Club has surpassed the 50-win plateau. The year was good enough to finish second in the CHL Top 10 rankings, helped along by the likes of Jayden Halbgewachs – who led the entire CHL in scoring – as well as stars Brett Howden, Kale Clague, Brayden Burke, Justin Almeida, Josh Brook and Jett Woo, among others. The 21-year-old product of Emerald Park, Sask., scored an astounding 70 goals and 129 points, to lead the entire Canadian Hockey League. His 70 goals serve as the first time a WHL player has reached the 70-goal plateau since Pavel Brendl achieved the feat by scoring 73 goals with the Calgary Hitmen during the 1998-99 campaign. The incredible season earned the former free agent a three-year, entry-level contract with the NHL’s San Jose Sharks. The 2018 Rogers WHL Championship Series will begin Friday, May 4 at 7 p.m. MT as the Swift Current Broncos play host to the Everett Silvertips.